SUKKAR: Former opposition leader in National Assembly (NA) and PPP senior leader Khurshid Shah has said Nawaz Sharif will be granted bail because he is unwell.“ Bail will be given to Nawaz Sharif because he is not well. In what case he has been sentenced it is not a case and in what case he has been acquitted, something could be done in that case. Country has to suffer by sending the politicians behind the bar”, he said this while talking to media men here Monday. He went on to say Nawaz Sharif has already undergone operations. If court releases him then it is his right. If someone thinks it will be NRO then he is ignorant of politics. If government says NRO is being sought then the names of those who are seeking NRO should come to open. Imran Khan should announce there would be no NRO. He held that media has played a significant role in pulling down our government and in annihilating Nawaz Sharif government. The media highlighted the matter of Dharna because only 10000 people were present in Dharna but media showed million of people sitting therein. Media is a big power even bigger than 220 million people. He underlined media could play pivotal role in bringing down government. But we are not in mood of pulling down government and we don’t want change in system. Because betterment of Pakistan lies in democracy. This country has come under debt and has been ruined because thing like democracy never remained prevalent here since 50 years. 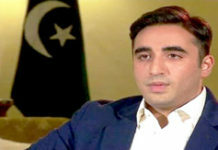 Citing to criticism against Bilawal Bhutto by Sheikh Rashid he said no one takes Sheikh Rashid serious. The man about whom Prime Minister Imran Khan had said that he would not appoint him as Naib Qasid is now sitting in his feet.